On Tuesday I briefly mentioned my process for scouting college prospects. With each prospect, I’ll spend hours looking at tape, statistical production, and athletic measurables. Athletic measurables are typically the thing I’m concerned least with. On Tuesday, we highlighted one such statistic – Speed Score or the weight-adjust 40-yard dash. Today, we’ll talk about two of my favorite production-based statistics for wide receivers, and the incoming rookie who dominated them. At PFF, we chart and grade every player in every game on every play. One of the many perks of my job is that I’m allowed access to this data and to unique statistics no one else has – or rather data that only fellow PFF employees and subscribers have access to. 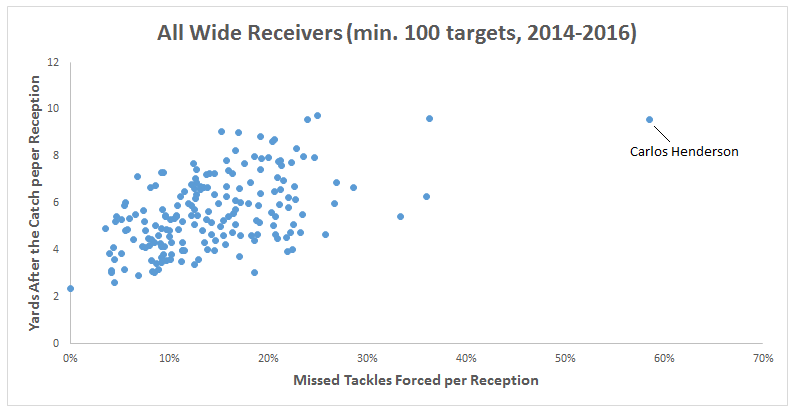 One such metric is missed tackles forced per reception – how many missed tackles a player forces per catch. Last season, Odell Beckham Jr. led all wide receivers in missed tackles forced (29). This was the second-most of any wide receiver this past decade. He also led all wide receivers with at least 15 receptions in missed tackles on a per-reception basis (0.29). For perspective, he forced as many missed tackles as Antonio Brown (9), Julio Jones (7), Jordy Nelson (4), Mike Evans (3), Desean Jackson (3), and Brandin Cooks (3) combined. Another statistic I’m particularly fond of is yards after the catch per reception. Among all 116 wide receivers and tight ends with at least 50 targets in 2016, Travis Kelce led the league in yards after the catch per reception (7.67). This shouldn’t come as a surprise, considering how highly Kelce has ranked in this statistic throughout his career. Kelce has three seasons under his belt with at least 75 targets. Since 2007, there are 709 instances of a wide receiver or tight end seeing at least 75 targets in a single season. All three of Kelce’s qualifying seasons rank top-15 in yards after the catch per reception this past decade, and he’s improved each year. Like with all metrics, missed tackles forced per reception and yards after the catch per reception are hardly perfect representations of receiving efficiency. Both statistics fail to adjust for the skill level of the opposing defense. Furthermore, both statistics are highly correlated to a low average depth of target. Missed tackles forced per reception has a -0.25 correlation to average depth of target, while yards after the catch per reception has a -0.23 correlation to average depth of target. This makes sense intuitively. The closer you are to the line of scrimmage, the more possible yards there are to be gained, and the closer you are to the line of scrimmage, the more defenders there are, and thus the more opportunities to force a defender to miss a tackle. Kelce ranked 21st of 27 tight ends with at least 50 targets in average depth of target. Beckham’s numbers are slightly more impressive when factoring in average depth of target, considering he ranked 47th of 87 qualifying wide receivers. Kelce and Beckham are both rare talents and players where we need to factor in extreme efficiency into our fantasy projections. Louisiana Tech wide receiver Carlos Henderson was drafted by the Denver Broncos in the third round of the NFL draft. I remember this fondly, because I already had several shares of Henderson in dynasty leagues, I loved the landing spot, and I shrieked in excitement like a little kid when he was selected higher than most anticipated. Although strength of schedule is something that isn’t factored into this data, and the competition in the C-USA division isn’t particularly strong, he did dominate statistically by such a degree that it’s almost shocking. Among all 35 charted wide receivers with at least 75 catches last season, Henderson led the league in forced missed tackles per reception (0.59). He didn’t just lead the league, he victory-lapped all other players, more than doubling the next-closest wide receiver. This was the highest rate among all wide receivers with at least 25 targets since we began charting college games in 2014. Henderson was no slouch in terms of yards after the catch per reception (9.57) either, ranking behind only Biletnikoff Award winner Dede Westbrook last season. When looking at both metrics, Henderson appears to be in a league of his own. Over the last three seasons, there are 186 instances of a wide receiver recording at least 100 targets in a single season. Henderson’s 2016 season is the one all the way at the top right. Of course, Henderson also ranked highly in a number of more traditional metrics. He led the league in touchdowns last season (19, tied with Corey Davis) and ranked sixth in receiving yards (1,530). He ranked seventh-best among all 149 wide receivers with at least 75 targets last season in yards per route run (3.55), 11th-best in yards per target (11.17), and 28th-best in drop rate (4.65.) He never fumbled in his college career. He was also our highest-graded kick returner last season, returning two kicks for touchdowns and ranking third-best in average kick return (32.3) among all 77 players with at least 20 kick returns. Over the last two seasons, Emmanuel Sanders and Demaryius Thomas each saw at least 130 targets, with the next-closest Denver receiver coming away with fewer than 35. This season, Mike McCoy replaces Rick Dennison as offensive coordinator in Denver, which could mean a more egalitarian target distribution going forward. Throughout their careers as offensive coordinators, Dennison’s WR3 (by fantasy points per game) averaged only 4.3 fantasy points per game, while McCoy’s WR3 averaged 7.4. Still, I think it’s unlikely Henderson is a serious fantasy contributor in his rookie season, but he is one of my favorite dynasty stashes (ADP player No. 37 in rookie drafts).